The Rental Assistance Demonstration (RAD) is a powerful tool for public housing authorities (PHAs), helping to improve properties and address the backlog of deferred maintenance. Like any innovative new tool, however, there are some uncertainties surrounding its use. Here are ten things to know. The Low Income Housing Tax Credit (LIHTC) could be negatively impacted by the change in the tax code. Many RAD projects rely on LIHTC to make the project work financially. If the tax reform reduces the tax rate under the new administration, and corporations don’t need as many tax deductions, the value of the tax credit could be reduced, negatively impacting the drive to remodel and repair our nation’s public housing stock. The next US Department of Housing and Urban Development (HUD) administrator could have a big impact on RAD and affordable housing. Ben Carson is slated to be the next HUD secretary. Whether he supports RAD or lets it wither remains to be seen. It took the Obama administration 18 months to implement new policies. Continue your RAD initiatives as if there weren’t any pending changes to ensure your projects move forward. RAD projects move public housing into uncharted territories when LIHTC is involved. Traditionally, developers of affordable housing have applied for LIHTCs. With public housing converting to RAD, they now compete with the traditional developers for those tax credits. Every RAD conversion is unique. In San Francisco, the city partnered with the housing authority to convert thousands of units at once so it could take advantage of financial assistance from two banks. In Baltimore, multiple developers competed to rejuvenate properties. In Greensboro, NC, employees received training and work was brought in-house to make the RAD conversion. According to James Cox, Executive Director of the Greensboro Housing Authority, you need to ask all your stakeholders, “Who do you want to be?” You must think long term. Communicate with your stakeholders as much as you possibly can, and be sure to tailor your message to your audience. In New York, when resistance to RAD conversion came from the alderman, the PHA distributed handouts showing the repairs and their value for the project undergoing renovation. In Texas, the Housing Authority of the City of Austin took a page from private real estate by building a model apartment showing what that building would look like post-RAD. Ease your burden with volunteers. Relocating residents can be complex and stressful. When relocation was necessary in Austin, TX, the PHA asked for volunteers to move. Enough people volunteered so that once a number of renovations were done the families would move in, but they only moved once. The volunteers moved multiple times allowing the relocation to be much less stressful on the resident population at large. Get to know your state finance agency and community development personnel. According to John Maneval, deputy director of Multifamily and Business Lending Programs in Maryland, you should get to know your state housing and community development personnel. They live with lending decisions that can last 30 years and prefer to know who they are involved with when making financial lending decisions. Small and medium housing authorities have different issues than large housing authorities. Expertise, experience, and total personnel counts impact the ability of the PHA to make the conversion. RAD is new and flexible. Take advantage of the opportunity afforded by a RAD conversion. The rules under the Annual Contributions Contract (ACC) are burdensome, inflexible, and static. Under a RAD agreement, you have much more flexibility in how and when to use your funds. 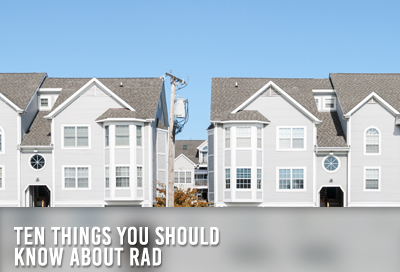 Make your move forward by converting to RAD as quickly as possible.